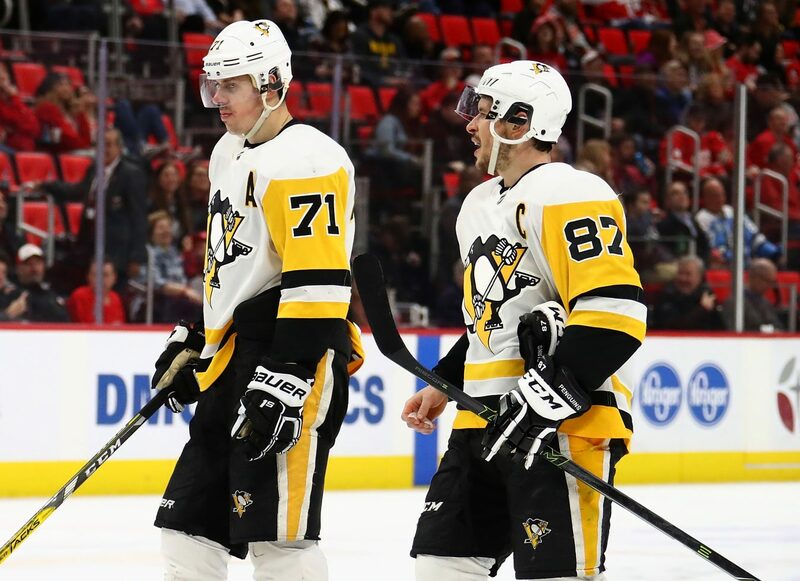 The Reports of Pittsburgh's Demise Have Been Greatly Exaggerated - The Point Data-driven hockey storytelling that gets right to the point. The Pittsburgh Penguins, by their standards, are off to a poor start this season. They have a 7-8-3 record through 18 games, which has GM Jim Rutherford concerned. “Has this team been together too long? It’s something I always have to watch for,” Rutherford said. “When do you have to make those changes? The players are doing everything they can to tell me now’s the time.” Rutherford followed up those comments by trading Carl Hagelin to the Kings for Tanner Pearson in hopes of shaking things up and his fellow GMs believe there is no one trying harder to make moves than him at the moment. But are the Penguins really in need of a major shakeup? 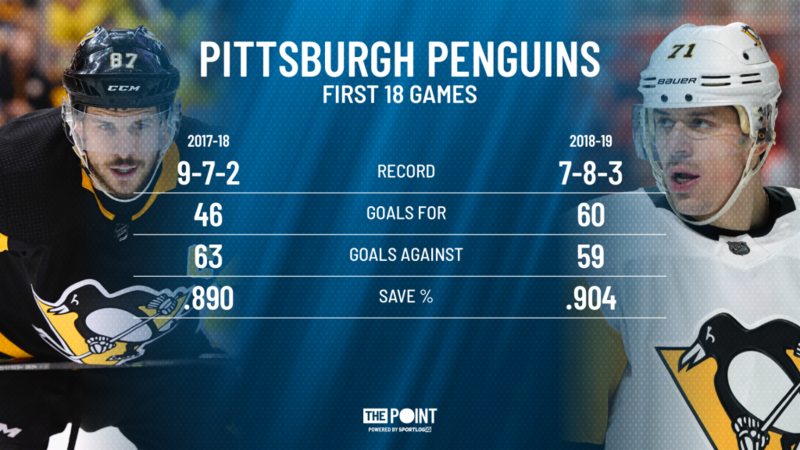 At first glance, the Penguins actually seem to be playing better than they were at the start of last season despite a worse record. Their goal differential went from a terrible -17 in the first 18 games of last season to a respectable +1 this year. In fact, Pittsburgh’s 30th place spot in the standings is rather misleading. So far, 22 teams have played 20 or more games and only the Florida Panthers have played fewer games than the Pens. Yes, Pittsburgh’s record is still disappointing, but their lack of games played exacerbates it. So, what’s wrong with the Pens? Is there even something wrong with this group? Let’s take a deeper look at both ends of the ice. Pittsburgh has seen a dip in its ability to generate quality shots, but it’s far from catastrophic. They still rank in the top half of the league in several key performance indicators and they’ve actually been more efficient with their chances, with better performances in true shooting percentage (goals/total shot attempts) and actual to expected goals. Through 18 games, the Penguins have six double-digits scorers compared to only four the previous season and, as mentioned before, have scored significantly more goals as a team. Their powerplay was also top 10 after 18 games in both seasons. So, if the offense isn’t the problem, it must be on the other end of the ice, right? Surprisingly enough, Pittsburgh’s performance in its own end is actually either identical or slightly better than the start of last season and so is their penalty kill (80.3% vs 80.0%). With all five of their rankings between 19th and 24th, they’re a unit that isn’t among the league’s worst, but they firmly rank in the bottom third of the league. 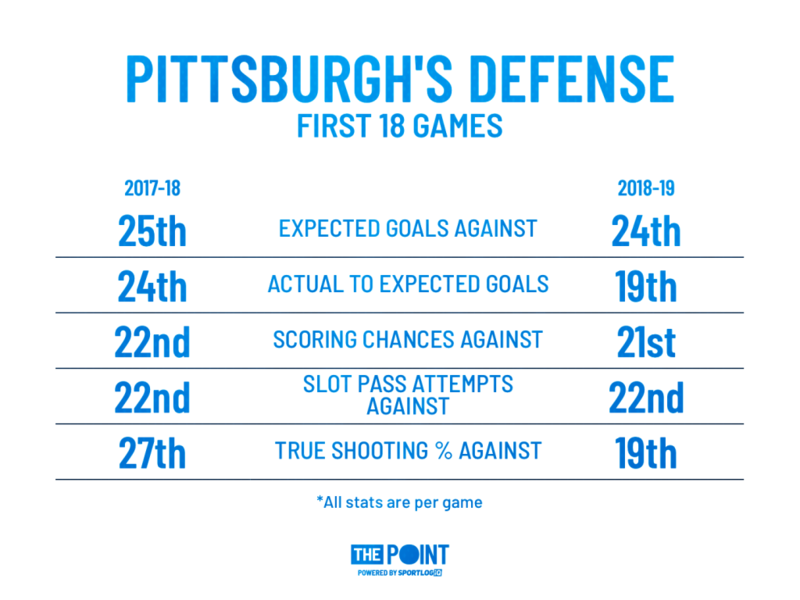 Defense never has been the Pens’ strong suit, but their offense is more than capable of scoring enough to mask their defensive shortcomings. After all, that’s what they did last season and they had no problem making the playoffs, pushing the eventual Cup winners, Washington, to six games in the second round. Goaltending was an issue for the Penguins to start last season and it’s been an issue again this year. 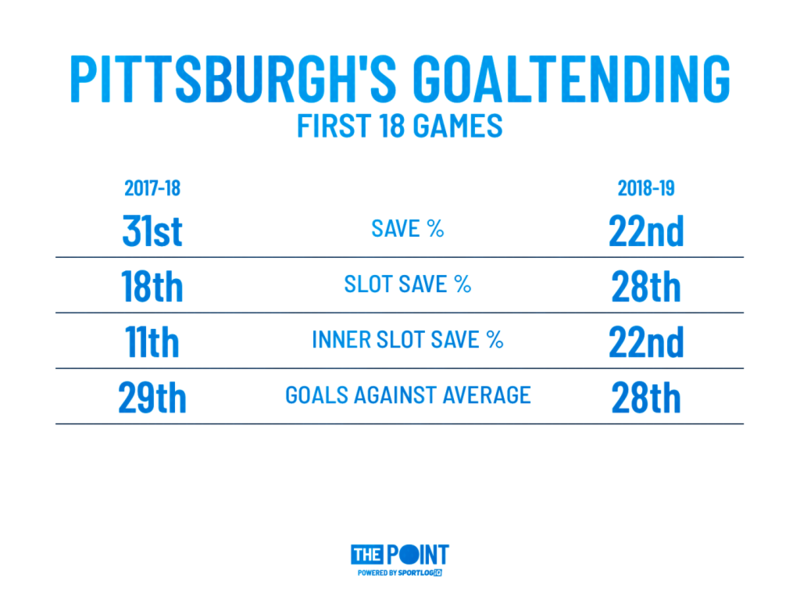 Pittsburgh had a better save percentage on high-danger chances last season, but the overall save % is actually better in 2018-19. Their GAA, however, remains in the bottom five. Matt Murray has dissapointed since Marc-André Fleury left for Vegas when he was handed the starting role, but the porous defense in front of him doesn’t give him much help either. 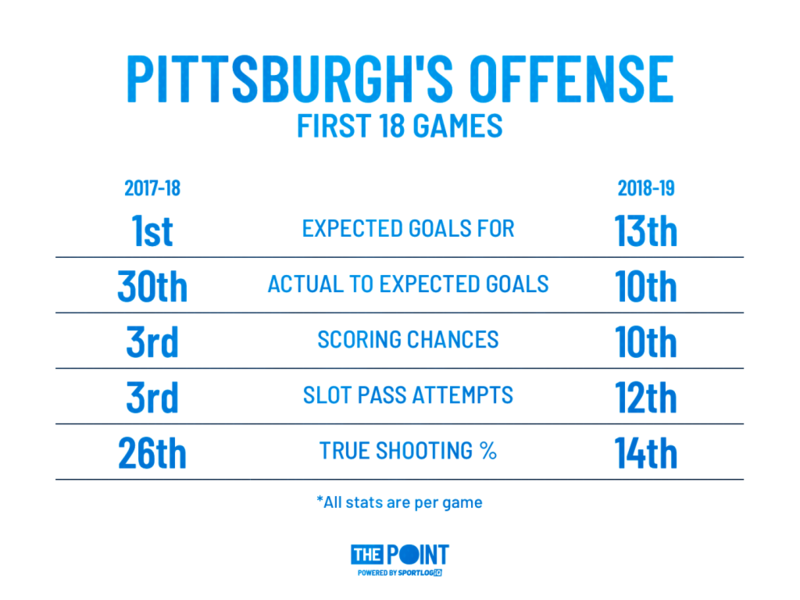 So Pittsburgh ‘s offense is more efficient on fewer chances, while their defense and goaltending remain nearly identical to the year before. In the end, skill usually comes through over the long run and the Penguins still have plenty of it throughout their line-up, boasting some of the best players in the league in Crosby, Malkin, Kessel, and Letang. To paraphrase the great Mark Twain, the reports of Pittsburgh’s demise have been greatly exaggerated. They turned it around last season and with so many similarities in their numbers to start this season, they deserve the benefit of the doubt to doing it again.